This is my favorite craft to date. And yes, I think I said that about the last wreath I made. But I had SO MUCH fun working on this wreath (well, except for the spray adhesive on my hand…more on that momentarily). This was tedious and time consuming, but what a labor of love! I enjoyed every single second of this project. I don’t normally decorate for Halloween. I’ve got my Fall decorations-my pumpkins and apples and leaves-but I’m just not into Halloween. Unlike most of our neighbors, who go ALL OUT for Halloween (with realistic things hanging in the trees, inflatables, tombstones, and a haunted house for the trick-or-treaters), I don’t like all the scary, creepy, ghoulish decorating, and I don’t really like dressing up either. 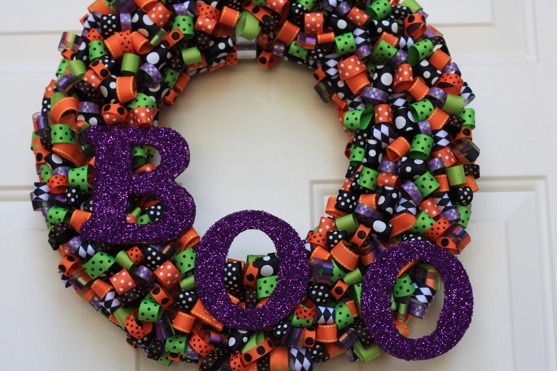 But when I saw the Happy Halloween Wreath that Jen from Tatertots and Jello (my craft-making hero!) 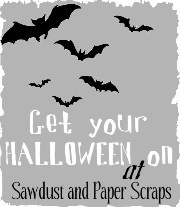 made, I decided that maybe there was a way to decorate for Halloween in a happy, cute, fun way after all! 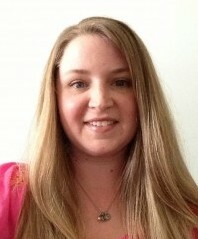 I owe Jen a million thanks for her amazing wreath idea and great photo tutorial. I never would have thought of this on my own! So this is my spin on a Happy Halloween Wreath. 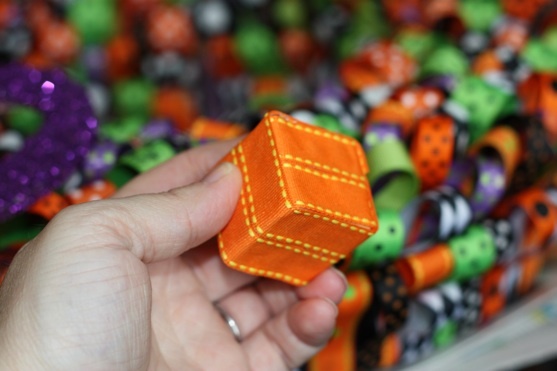 use varying widths of ribbon. I wish I had used more wide ribbon. 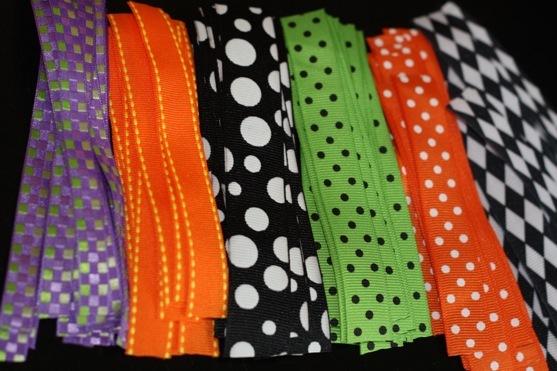 Select 10-15 different ribbons. 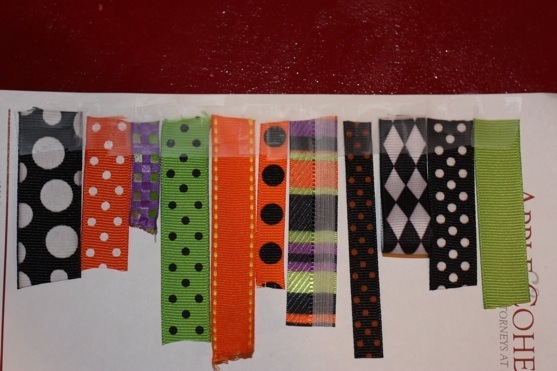 I used 12, partly because when I ran out the first time, I could no longer locate the ribbons I picked the first time. I had to mix in new patterns (and yes, my non-flexible self had to do some deep breathing when I first realized this). But I LOVE the interest my 12 different ribbons add. 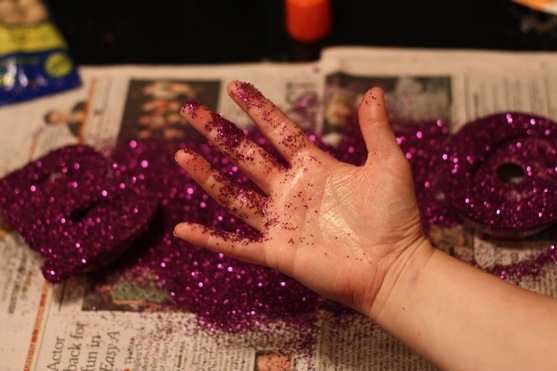 avoid sheer ribbon unless you enjoy getting hot glue all over your fingers. Lesson learned. Here is my ribbon “line-up,” minus one. This was definitely a handy piece of paper to have when I had to run back to buy more ribbon. I was clearly drawn to polka dots. Guess what? Polka dots make me happy. So does that harlequin pattern. Cut the ribbon into 4.5 inch strips. I measured one every few minutes to use as a guide strip, but for the most part, I eyeballed it. Mine probably range from 4 -6 inches. But that’s okay. We’ll call that “adding visual interest” instead of being sloppy, ok? 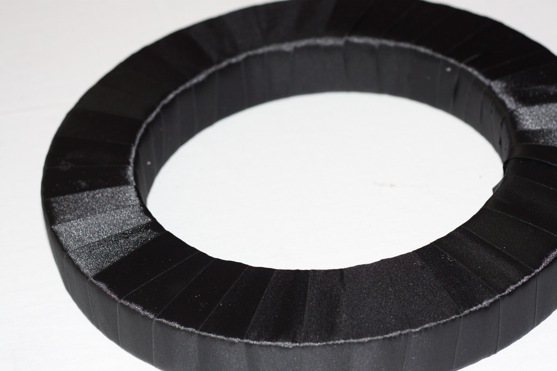 Now it’s time to create loops with the ribbon, leaving a little room (approx 1/4″) at the bottom, beneath the “seam.” You can either sew these, as Jen from Tatertots and Jello did, or if you don’t have a sewing machine, you can hot glue them like I did. 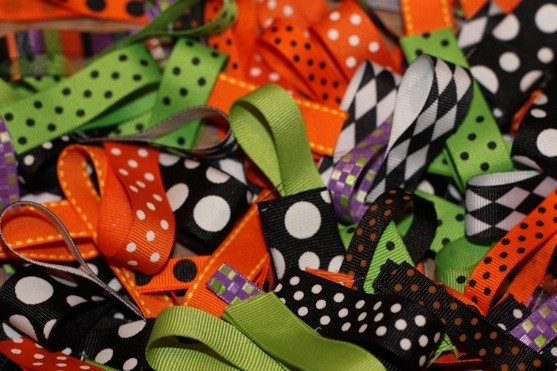 I worked with 3 to 4 strips of ribbon at a time…that’s how fast I could glue then fold them down before the hot glue dried. I just threw all of my loops in a big box as I went. Think you’ve got enough? You probably don’t. Make MORE! 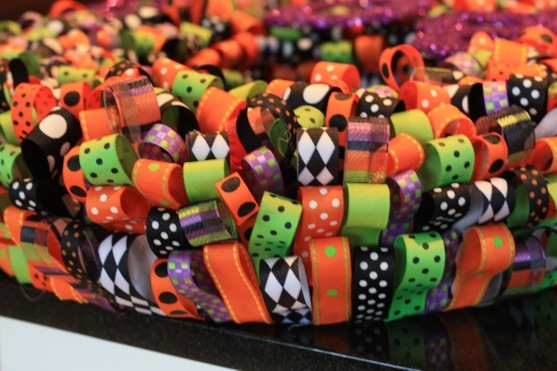 Time to start gluing your ribbon loops to the wreath form. I worked on the front/top of the wreath first. You need to separate the part of the ribbon below the “seam” you created. That’s what you’ll be gluing down. See what I mean in this not-so-great-photo below? Just keep adding more loops to your wreath, placing them at random angles. Shove them together as close as you can so your wreath will look nice and full. Once you have the top of the wreath filled in, it’s time to work on the sides! I was struggling with my method for the sides until The Picky Apple stepped in with his genius suggestion to layer the ribbons on the side, so the top of the loops are all still facing the front of the wreath (instead of poking off to the sides…). Either way could work, but this is what I did. See how they are all facing up toward the top of the wreath? (Those are my hands, not The Littlest Apple’s. Remember how I said I had small hands?) Now, how to get those letters stuck on the wreath? 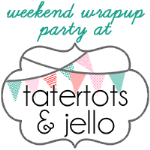 Jen from Tatertots and Jello used some large wooden beads. I bought some, but mine weren’t quite big enough. Since I was getting antsy to just be finished, I got creative and shopped the house for a solution. 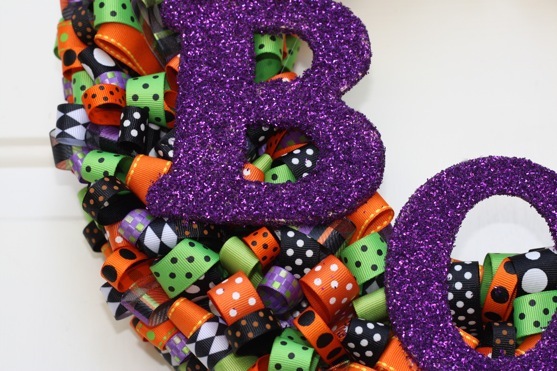 Then I hot glued the blocks to the wreath, then glued the glittery letters to the blocks. I was going for an off-centered look, but that “O” on the right looks like he’s saying “Help! I’m falling off the wreath!” He’s not. He’s glued on very securely. Just a little crooked. I LOVE my new wreath! I’m already thinking about making another ribbon wreath for Christmas or Easter (or both!). 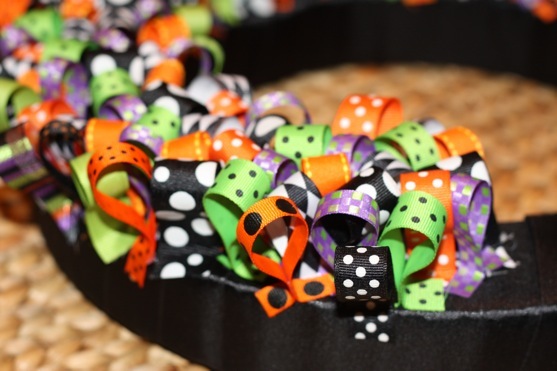 The possibilities and color combos for this type of wreath are ENDLESS!